I am not a vegetarian or vegan, but I have recently become obsessed with making more vegetable-centric dishes. I see it as a challenge. Last week I made two vegetarian dishes that I definitely plan on keeping in my arsenal. I don't have recipes for them per se, I just improvised and threw a bunch of stuff together, as I always seem to do lately in the kitchen. I love the variety of tastes and textures going on in this dish. Bascially, the dish is what the title says. You can cook the farro in water or broth, then add a sprinkle of curry powder and cumin. Mix in the red pepper, green onions, dried cranberries, and pecans. Serve room temperature or cold. Who says meatless dishes can't be meaty? Any time you grill a vegetable, that smokiness will often give it a meaty quality. 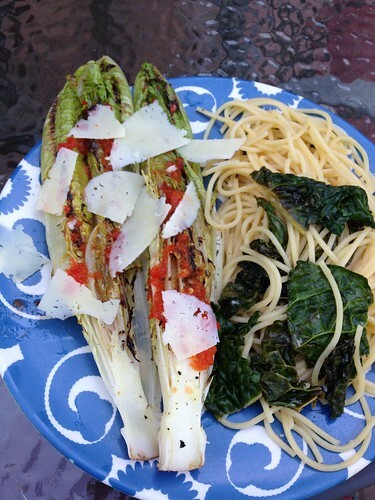 I cut the romaine head in half longways in order to get even more char on it and then drizzled the red pepper dressing over it and shaved some pecorino over top. To make the red pepper dressing I used Ajeeka, a raw red pepper and garlic sauce, and just mixed that with extra virgin olive oil. It's very simple but probably my favorite salad dressing. I love grilled greens! We do bok choy and other cabbage vegetables quite a bit. I never thought about grilling lettuce. Must try. And I love all the ingredients in your grain dish. Wow -- I would have never thought to grill romaine lettuce. The dressing sounds yummy. I'm now curious to try some farro. I need to try grilling lettuce. I have seen recipes for it many times and it looks so good. My husband and I are trying to incorporate more veggies into our life and this would be a great way to add some variety beyond salads. I've never had farro before, but that dish looks great! I had no idea you could grill romaine. Your meals here look delicious. I find that I too am looking for more and more meatless dishes. Your grilled romaine and kale pasta dish looks like such a wonderful meal. Your grilled romaine and kale pasta dish looks so wonderful. Guess I'll be trying grilled greens this week... thanks! Never would have thought to grill romaine, but we all love it, bok choy and kale. 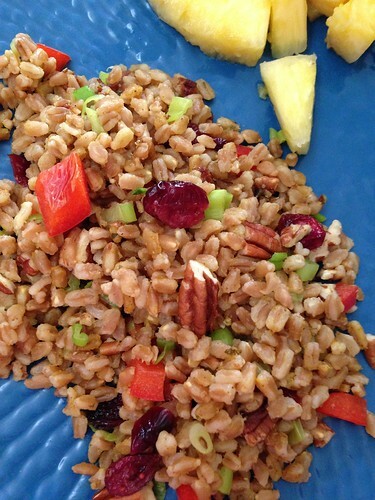 The farro dish looks so yummy and I'd like to make it. First I have to find out what farro is LOL! Thanks for this! We grilled romaine last summer, but I forgot all about it. I'll get that back in the repertoire! And, I'm putting Ajeeka on the Whole Foods list. I never heard of it, but it sounds perfect. This is why I love Weekend Cooking! I'm not a vegetarian either, but I do like to eat a lot of vegetarian meals, and these two look like a great couple to try.